Do You Have Pioneer Heritage? Has your family lived in the United States for generations upon generations? If so, then someone in your family tree braved vast oceans and unknown rugged lands to make a home and create a family. One of the best examples of the spirit of American adventure lies with the pioneers, who traversed the great plains and mountain ranges of the U.S. to populate first the interior, then the territory west of the Rocky Mountains. 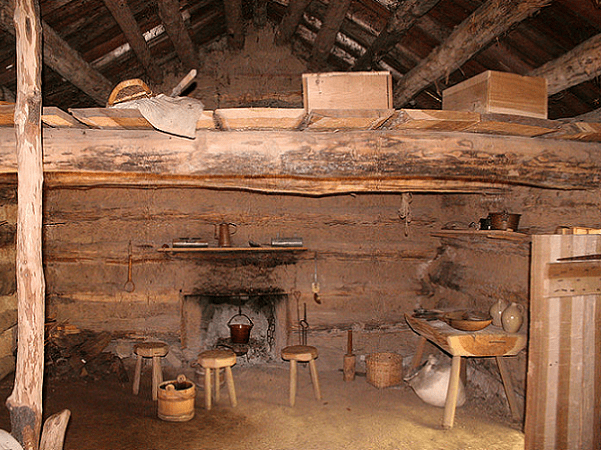 Photo: interior of a recreation of a log cabin at Conner Prairie living history museum in Fishers, Indiana. This is the fur trapper cabin in the Lanape Camp part of the museum. Credit: Derek Jensen; Wikimedia Commons. Learn more about your pioneer heritage, how to research your genealogy, and how to identify where your pioneer ancestors lie in your lineage. The term “pioneer” refers specifically to the first people who settled in the western edges of the continental U.S. in the late 1700s to the mid-1800s, in search of land, freedom, and opportunity. Their strife mirrors the challenges, risks, and opportunities the country’s original settlers faced upon their arrival at Plymouth Rock. Unlike their predecessors, the Pilgrims, the pioneers were not fleeing religious persecution or the oppression of a rigid government. The pioneers instead were driven west by the desire to own their own land, to realize the American promises of individuality, liberty, and unlimited possibility. If you have a long family history in any of these states, you may have some pioneer genealogy from the very first pioneer migration in America. Did your ancestors move west in search of gold, land, and opportunity? Find out using newspaper archives to uncover stories of your ancestors during this period. The great pioneer migrations of American history share a commonality with most other migrations across the world: they were often sparked by political events or coincided with those events’ lasting effects. For example, the Louisiana Purchase catalyzed the first migration in the late 1700s that populated much of the South. The Mexican-American War led to a huge acquisition of land in the Southwest and West, such as New Mexico and California, opening up new opportunities for pioneers to claim land for themselves. Natural resources were a powerful motivator as well, such as the coal mining in the Rocky Mountains or the Gold Rush of 1848 throughout California. The federal government also encouraged many pioneers to scout out territory and populate it for the nation. The American government dispersed generous land grants and other monetary incentives for settlers to start farms or ranches and contribute to the nation’s booming agriculture industry. The pioneers lived a life full of danger, uncertainty, and risk. Women and men shared most of the farm work, though they had distinct familial roles as it pertained to childbearing and sustaining the family through the rough winter season. As many pioneers spent months – even years – traveling from one place to the next in what is now the United States, food had to be well preserved. A pioneer’s next meal was always an uncertain one, so reserves of preserved food were integral to the survival of the individual as well as the family. As such, the pioneer diet consisted primarily of corn and big game captured along the trail, salted and dried to preserve it for weeks. Corn was preferred while on long journeys through America’s heartland because it was easy to prepare and often plentiful. Perhaps you’ve wondered amongst your family: “How far back does our pioneer heritage reach?” One of the best ways to discover your family’s brave history is by scouring through old newspapers and historical articles written during the time your family embarked on its journey through the United States. These sources of information will give you a contextualized idea of the state of the nation at the time your ancestors were alive. Government documents can be especially helpful in learning if. your ancestors were involved in American pioneer history. Look for land grant records, birth certificates, and business contracts submitted to the federal government for tax purposes or to collect grant money. You may even stumble across letters and diary entries from family members writing to loved ones back home, updating them on their dangerous trans-American journey. You may come from the people who pioneered the fiercely American values of independence and self-reliance that remain ingrained in American culture. Dive into old records online or in boxes buried somewhere in your relative’s home. Learn about your family’s experience and trace your pioneer heritage today.